Well… [looking around…] It’s been forever, but I am back! Now, it wouldn’t be fair of me to come back after such a loooooooooooong hiatus without something special to make a trip here worth you while, now would it? So here it is… flag cake. Just in time for the 4th of July!! 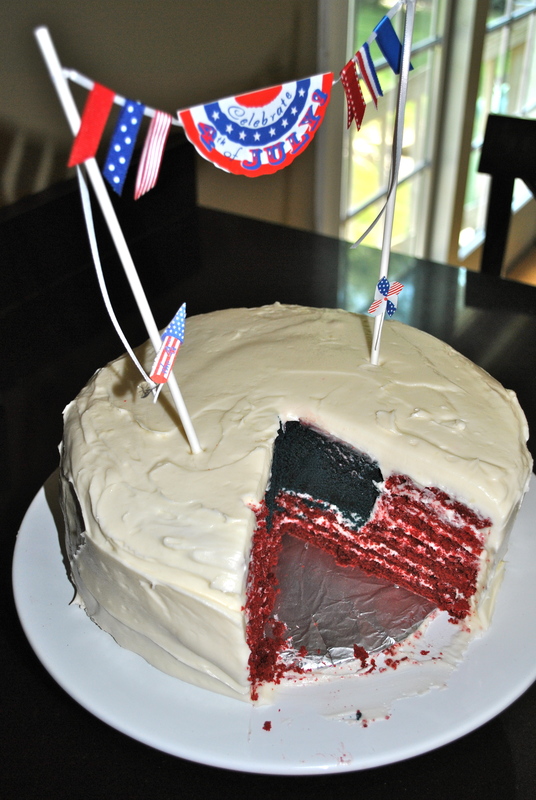 Now, to be honest, I will say that flag cake was not my completely original idea. Last June, I was looking around ye old Internet for a 4th of July dessert to make for an upcoming party and I found this from Elissa of 17 and Baking. Elissa is a lovely person who makes wonderful recipes so definitely look around her site! I thought it was such a cute cake when I saw it, but I wasn’t completely sold and continued looking around at other ideas. Three or four sites later it hit me: I could make that cake into a more realistic looking flag AND make it out of red velvet. “No problem!” I thought and never looked back. Now if you are going to attempt my version of this lovely, please note that it takes time and patience. Short on one or both? Elissa’s cake is beautiful so go for it! 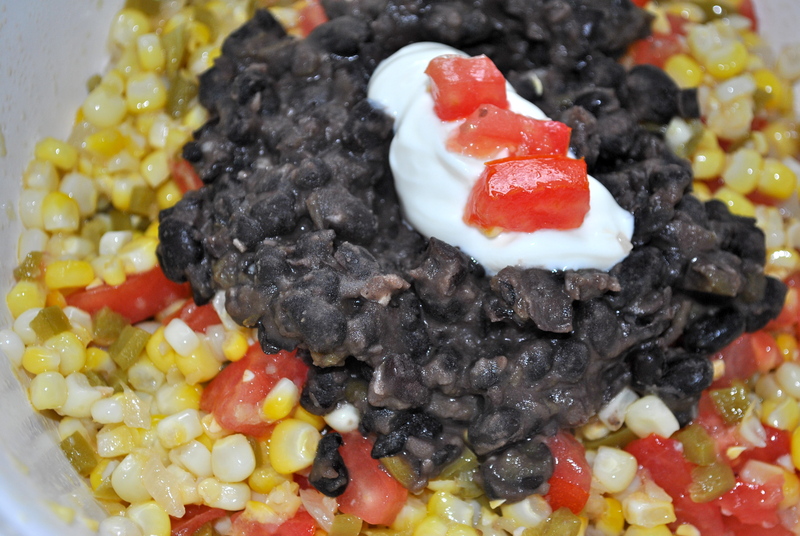 Corn with black beans! Okay, I’ll admit that I did mess this up because I wasn’t paying attention and sauteed the bell pepper with the onion. Oops! It still tasted great, but I USUALLY add the bell pepper the last few minutes of cooking so that it stays vibrant. I do have an “official” hot corn salad that I LOVE and which I’ll post at a later date, but I also like to change it up and make it really simple sometimes like I did here. Let’s face it, I just needed dinner to be FAST so I harnessed the power of leftovers and quick-cooking vegetables to make it happen. The general idea is to saute a sweet onion and garlic in olive oil. Add freshly shucked corn and the juice of a lime. Cook on low for 10 minutes, mixing occasionally, and add a diced bell pepper if you like. (Red, green, or whatever color you have handy.) Cook for a few more minutes until the corn is tender to your taste. Mix in a diced tomato or two if you like. I love this kind of dish because you can add whatever you are the mood for, have on hand, or just plain works for you and/or your family. A bit of salt, a bit of pepper if you like and you’re good to go. Here I topped it with some leftover black beans from two nights before, a dollop of sour cream, and mixed it together before serving. Corn = summer. 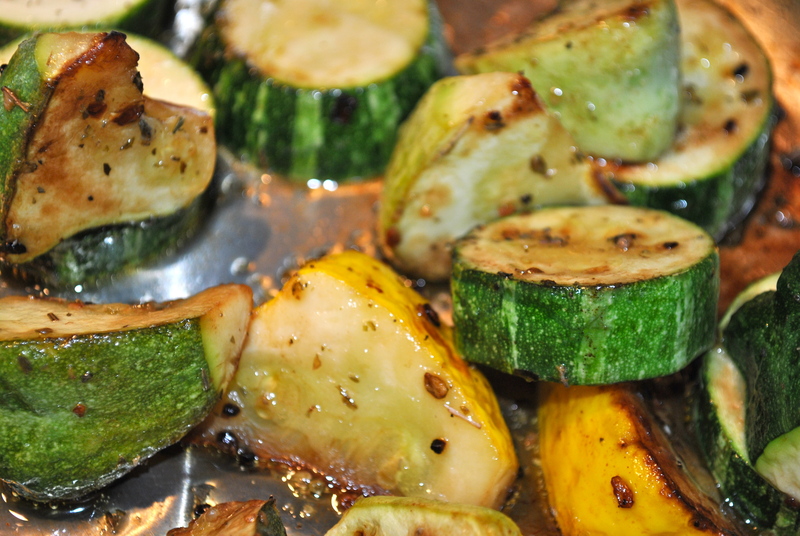 Sticking with my need dinner FAST theme, I seared my squash in a splash of olive oil and a couple of minced garlic cloves while my corn was cooking. Then I sprinkled on a pinch or two of salt and big pinch of dried herbs (pick your favorite). I served my farm stand bounty with the other half of my roast chicken from dinner the night before. 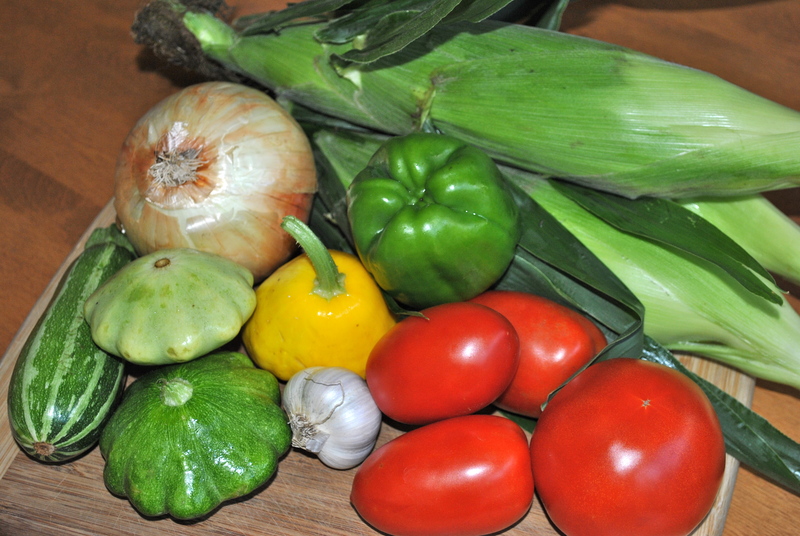 Including prep time… fifteen minutes and dinner was done. I have mastered science!! This may not be the moment you’ve all been waiting for, but I don’t care. This is it!! 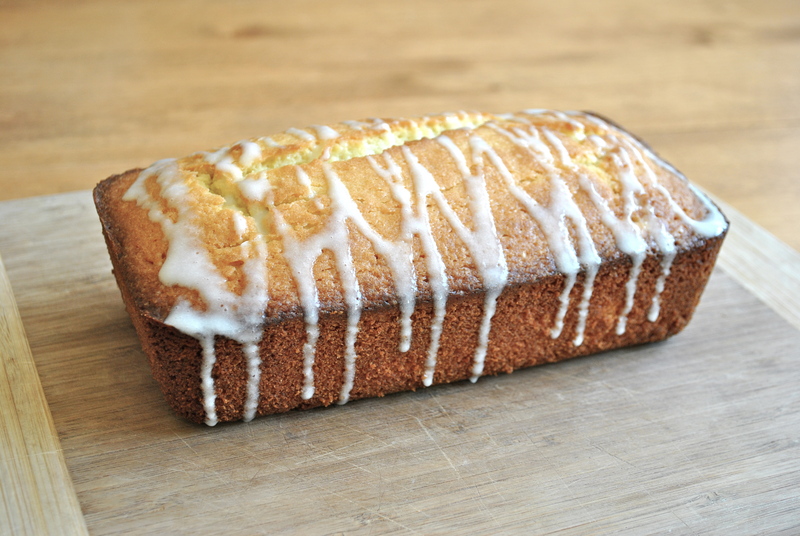 The very first cake recipe I developed on my own. It needed one little tweak from it’s first incarnation, but I’ve made it three times now and I’m pleased with the results. I never thought I would be able to make a cake on my own, but that was before I studied up on a little science and applied a little logic. Woot! …I wonder if the Noble committee will consider me this year? 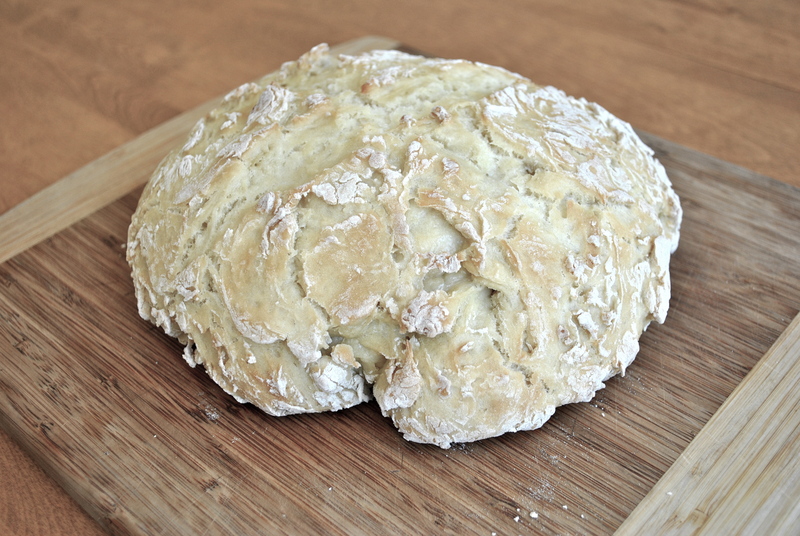 This is definitely not my bread recipe, but I love it. This is a no-knead, no rise time, no yeast, quick bread from Darina Allen that Alice Waters shared in her book In the Green Kitchen: Techniques to Learn by Heart. Alice Waters is a pioneer of the local food movement. Her recipes are always simple yet they produce remarkable results. In the Green Kitchen is filled with the same kind of simple, yet delicious recipes that Waters is known for but this volume is filled with recipes from her friends who just happen to be culinary superstars of the natural food movement. Many libraries carry this book and it is definitely worth a look. True story: Standing in the Publix produce department, I once saw a rather haggard, middle-aged woman take an apple and rub it all over her face and neck then decide that wasn’t “the one” and put it back. She proceeded to test out the next apple. I don’t want to know what kind of relationship that woman has with fruit but… REALLY? I’ve seen several people on the web say that produce wash is a waste of money and that the only thing you need to do is rinse your produce under running water. Really? Do you honestly think that water is going to wash off the added zest of Ms. I-Rub-My-Body-With-Produce? I fully realize that a mentally ill woman pleasuring herself with produce in the middle of the store is not all that common, but a simple splash under the tap is not going to solve common problems such as produce wax trapping pesticides and bacteria on your food, and surface germs from people who haven’t washed their hands. Produce was cannot remove all wax, remove all pesticide, or sterilize your food, but does significantly more that water alone. That said, I agree that the big problem is that $6 for a bottle of veggie wash is a complete rip off. So, I make my own.